Full of surprises, humour, and heart, Broadleaf Theatre proudly presents its award-winning show Bite-Sized as part of the 2016 Toronto Fringe Festival! 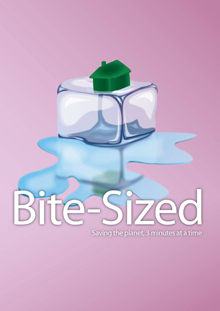 Featuring a whirlwind collection of over 15 plays, all 3 minutes or less, Bite-Sized is a theatrical experience tackling local, national, and global environmental issues. From an aerobics dance work-out through time to an exploration on Sarnia’s Chemical Valley, and even a hip hop dance sequence about an invasive frog species, you can enjoy all of the content with none of the guilt. Go on, take a bite. Bite-Sized will take place at the Factory Theatre Mainspace June 30 – July 10, 2016. Tickets are $12 at http://fringetoronto.com/ and at the door. Sized won the President’s Award for Best Production and Viewer’s Choice at the 2014 U of T Drama Festival. Created and directed by Kevin Matthew Wong (Half Full, Mixed Company Theatre; paper SERIES, U of T Drama Centre). Performed by: Steven Pereira (The Stranger, Dopolavoro Theatrale/ Summerworks 2015), Parmida Kakavada (A Little Princess, Wavestage Theatre), Angela Sun (4.48 Psychosis, U of T Drama Centre), Alex Treude (Theatre of the Film Noir, U of T Drama Centre), and Emma Tse (Rules of Love, Poculi Ludique Societas), Mimi Warshaw (Plays of Our Lives, Second City Toronto Training Centre) and Jordan Angrove (The Broadleaf Plays, Broadleaf Theatre). Tickets are $10 at the door, $12 in advance. The festival also offers a range of money-saving passes for serious Fringers. Tickets can be purchased online, by telephone (416-966-1062), from the Fringe Club at Honest Ed’s Alley, and — if any remain — from the venue’s box office starting one hour before curtain. This venue is wheelchair-accessible provided you arrive early (at least ~20 minutes) and notify the House Manager you require an accessible route.